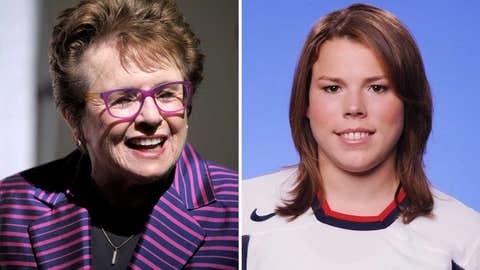 Billie Jean King (left) and Caitlin Cahow will make a strong statement as part of the U.S. delegation in Sochi. The head of Russia’s state media got up last year and left no doubt where his boss stands on gay rights. Dmitri Kiselyov told a TV audience that fining and jailing gays for “propagandizing” homosexuality wasn’t enough. That pretty much sums up why Billie Jean King recently received a phone call from the White House. She was asked to be part of the official U.S. delegation to the Sochi Olympics. Honored to represent USA in Sochi and I hope these Olympics will be a watershed moment for the universal acceptance of all people. Forty years ago, she beat Bobby Riggs in the “Battle of the Sexes.” Now she’s been charged with at least symbolically putting a real tyrant in his place. Vladimir Putin has criminalized homosexuality in Russia. If it’s publicly discussed in a positive way, citizens are liable to be thrown in jail. Even tourists now face two-week sentences if they commit the crime of being gay in Mother Russia. The crackdown has stoked homophobia to levels Stalin would love. Human rights groups stay busy tracking beatings and murders. In a recent poll, 15 percent of gays said they have been assaulted in the past 10 months. At best, they face daily humiliation. At worst, they get their photos posted on anti-gay websites and are hunted down with no repercussions. All that naturally led to calls for the U.S. to boycott the Winter Games. The motive was understandable, but the tactic would have backfired. Most Americans didn’t like when we skipped the 1980 Moscow Games. It’s never seemed right to force thousands of athletes to give up their Olympic dreams as a political statement. And Jimmy Carter’s boycott was over an issue every American agreed on. The Soviet Union should not have invaded Afghanistan. There’s no such consensus on this issue, at least if you go by polls on things like gay marriage. Opinions aren’t just split, they are intense. Making our hockey team stay home in the name of gay tolerance would have been a public relations and political loser. This week’s decision was an ideal compromise. King is as widely admired as she is openly gay. She’ll be joined in the U.S. delegation by Caitlin Cahow, a gay hockey player who won medals in the past two Olympics. It’s equally notable who won’t be there. No Barack Obama, Joe Biden or Michelle Obama. There are other issues in play, like Edward Snowden, missile defense and Putin’s ongoing strongman routine. They’ve led to a diplomatic snub of the first order. It’s the first time since 2000 that a U.S. president, vice president or First Lady hasn’t attended an opening ceremony. The delegation will be led by Janet Napolitano. Nothing against the former Secretary of Homeland Security, but everyone’s cameras will be focused on the former tennis champ with the tenacious heart. “I hope these Olympic Games will indeed be a watershed moment for the universal acceptance of all people,” King said. The fact millions of people are talking about this shows how Putin has lost control of the Olympic narrative. He wanted Sochi to be a glorious Russian infomercial. It’s been pre-empted by controversy whether athletes will be expelled if they wear rainbow pins. The Russians initially banned all protests and demonstrations. Now they are allowing special protest zones during the Olympics. Don’t expect nightly updates via state media. The Russian audience will see everything through a Putin-approved lens. Protest zones will be shut down about 10 minutes after the Olympic flame is extinguished. And like Moscow in 1980, people will wonder what the symbolic gestures really accomplished. America’s official delegation isn’t going to magically transform Russia into a San Francisco. But we couldn’t show up at Vladimir’s big party and pretend not to notice what’s been going on. Regardless of how you feel about gay marriage, etc., no human should have to live as gays do in Russia. King’s mere presence will make that point for all of us. And we can always hope she’ll wander into the Russian delegation and get to ask Putin a thing or two. Like whether he thinks her heart should be buried or burned. Take it from Riggs. When it comes to these battles of the sexes, you don’t want to face Billie Jean King.